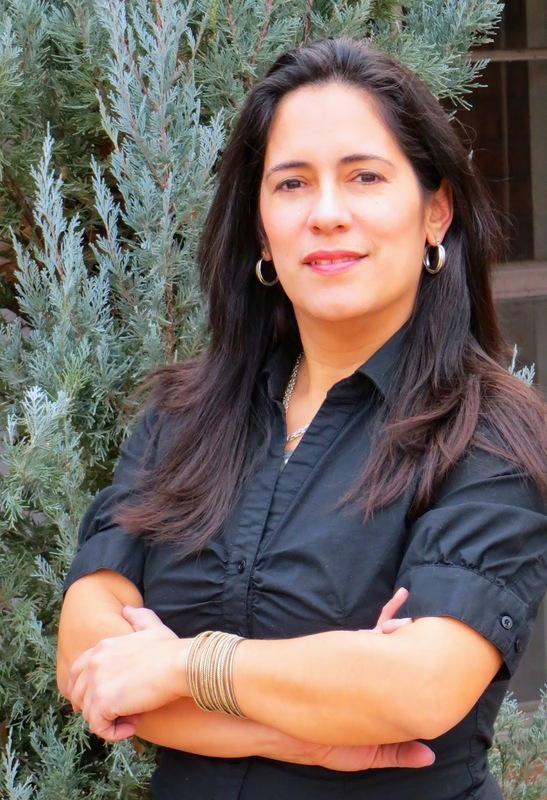 Please welcome back, children's book author and mother of three, Mariana Llanos. 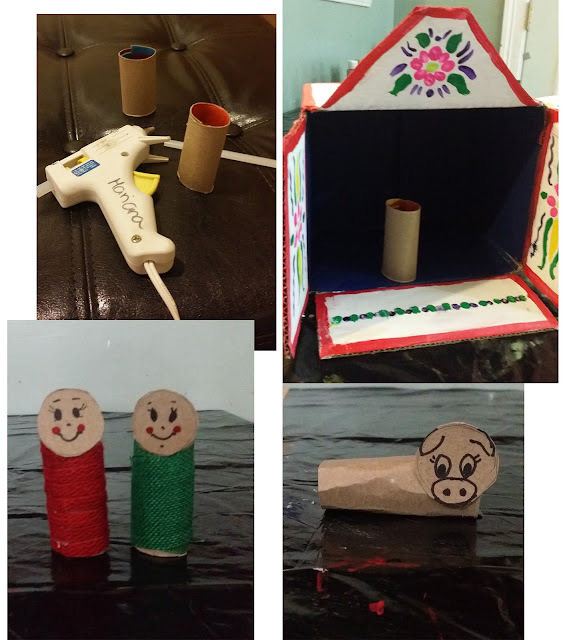 One of my favorite crafts to do around Christmas is a nativity scene. 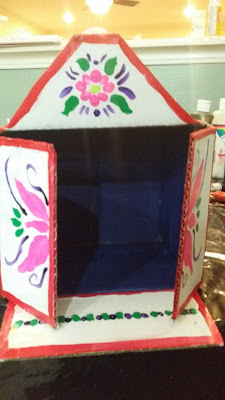 Today I’m making a recreation of a Peruvian retablo. Peruvian retablos are a form of art typical of the Andes. They have their origin in the altar boxes brought by the Spaniards, but over the centuries they developed into a folk art expression. 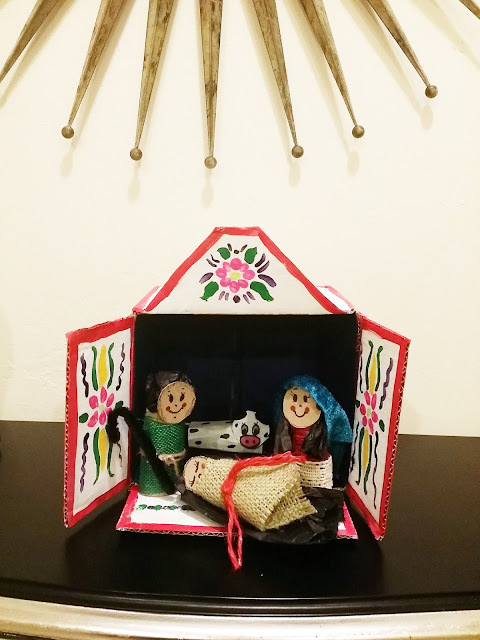 Retablos usually depict religious scenes, like the nativity, but also other important cultural, political and social events. 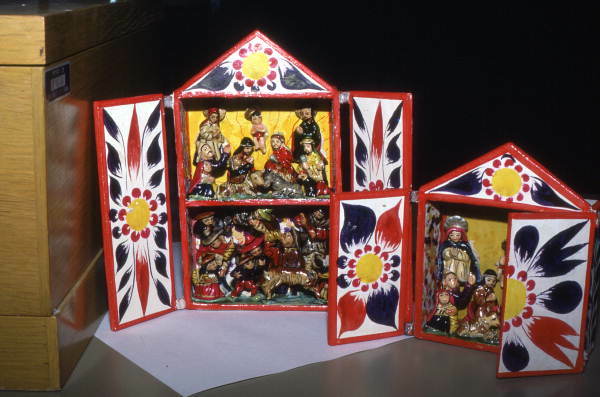 Retablos are also a form of storytelling since they represent and preserve oral traditions. 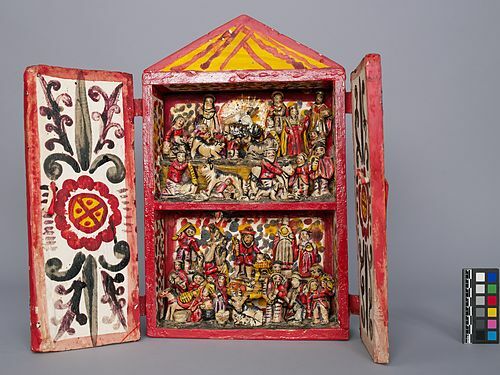 Typical retablos are made of cedar wood boxes, painted with vibrant colors. The figures are made out of special clay, a mix of potato flour and gesso, carefully crafted and fixed inside the box. 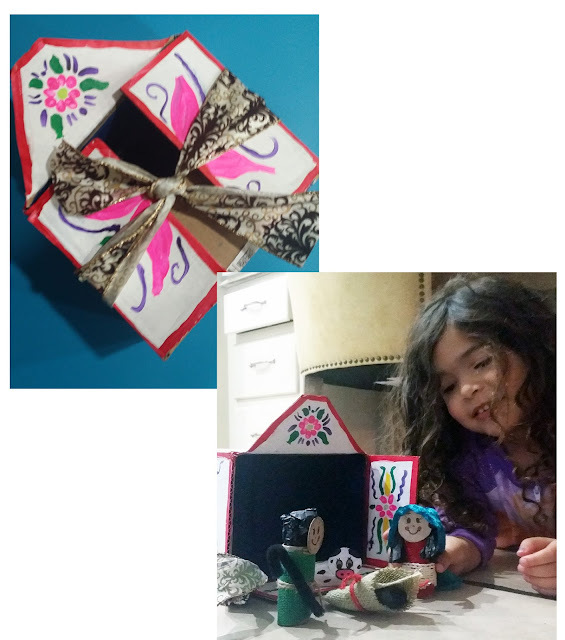 For this craft, my own interpretation of a retablo, I’m going to use mostly recycled materials. We start by finding ‘the right box.’ I think this is the most important step. Determine what size box you want to use; make sure it has no dents, and that its flaps are in good condition. If your box has any packing tape you may remove it and replace it with masking tape. That way you’ll be able to paint over it. Now gather the whole family and give each person a task. This is a family project! I chose a small box, fixed it with masking tape, and painted it white. Then, I painted the inside with dark blue. I gave it a couple of coats for optimal coverage. Once it was dry, I painted red lines in all corners as shown in the picture. My brush was a flat point size 8. After it was all dry, I went back with a little bit of white to retouch and fix the parts I had messed up. There were lots! I let the paint dry while I chose my color palette: hot pink, dark purple, green, and yellow. I chose these colors because I wanted it to be traditional. Usually, retablos are decorated with flower motifs, arabesques, and geometrical figures. First, I made flowers on the inside flaps just by pressing my rounded brush around, like making petals. You can use a stencil or anything else that can help you. I suggest you practice your design on a piece of paper before painting on the box. A good thing to remember is that these decorations are simple and symmetrical. 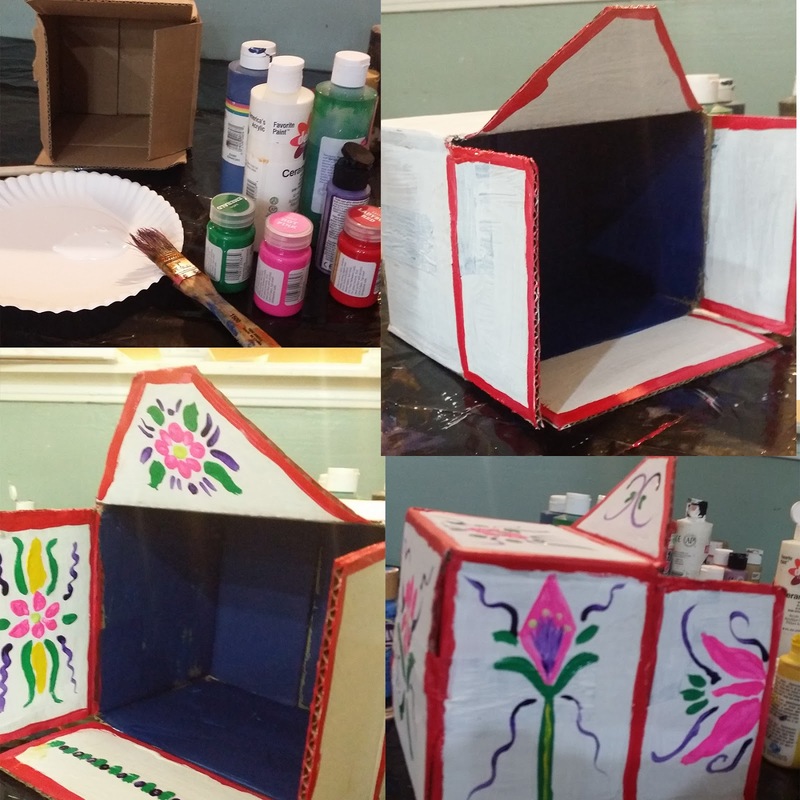 I made my designs in all the panels of the box. I didn’t have to, but my daughter wanted flowers everywhere. Once this was dry, I painted the outside flaps. Usually, retablos have half of a flower on each flap so it looks like one flower when the flaps are closed. I did my best to make it that way, even though my flaps will not close together since the box is not a square. Also, if you notice, I cut the corners of the top flap to shape it like a trapezoid. You can make it into any shape you want. 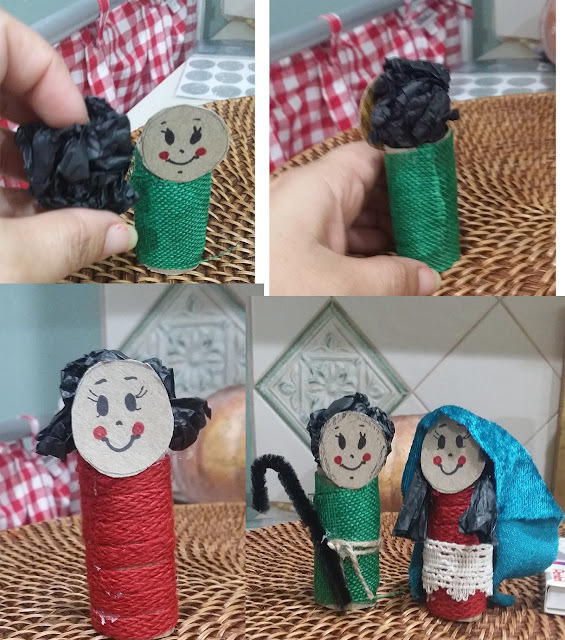 While our house dried, I started crafting the little people. I used cardboard from a cereal box. The most important step is to calculate their size. If you make them too big, they won’t fit in the box. I cut faces and painted them with sharpies. Then I put everything together with hot glue. I had a lot of fun deciding what they were going to wear. I used burlap because of its rustic texture. For the head, I used a crumpled ball of tissue paper and fixed it in place with a dab of glue. If you were going to make a bigger house, you could use toilet paper rolls and use Styrofoam balls for their heads and faces. You can use anything you have handy to decorate these cute little figures. 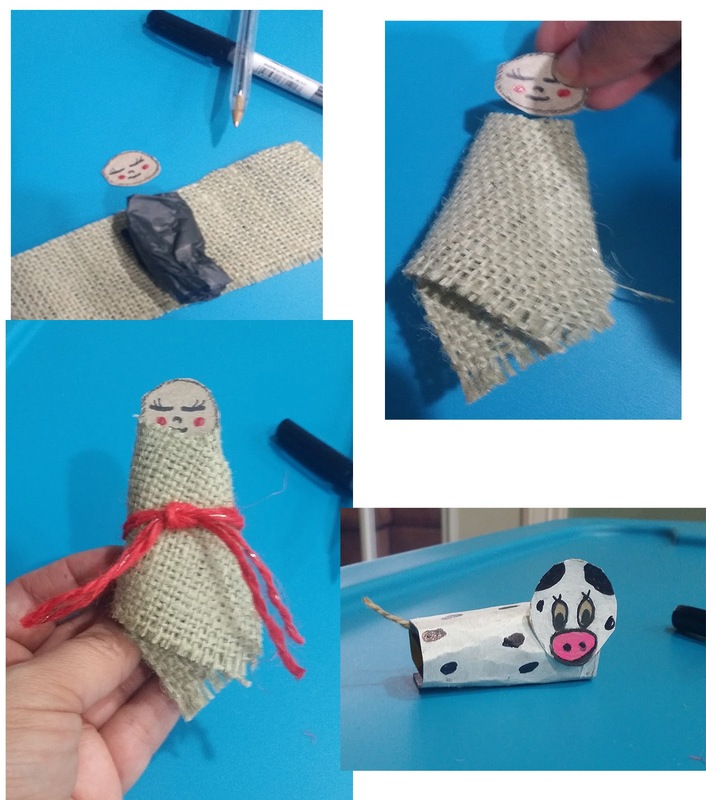 For baby Jesus, I used a small rectangle of burlap, cramped tissue paper and a cardboard circle for his face. I bundled everything with the help of hot glue. Isn’t he cute? We even made a cow… well, I know, it could be a Dalmatian, too. Before I put the holy family in, my daughter thought it would be nice to let her princesses in for a house tour. This Peruvian-inspired nativity is a great reminder of the reason why we celebrate Christmas, but even if you’re not religious, you can create your own scenes: from your family life, your favorite movie, etc. The best part is that after Christmas you can pack everything away in it and save it for next year. With a nice ribbon, it can be a great present! This is the time of the year to strengthen bonds and make memories. 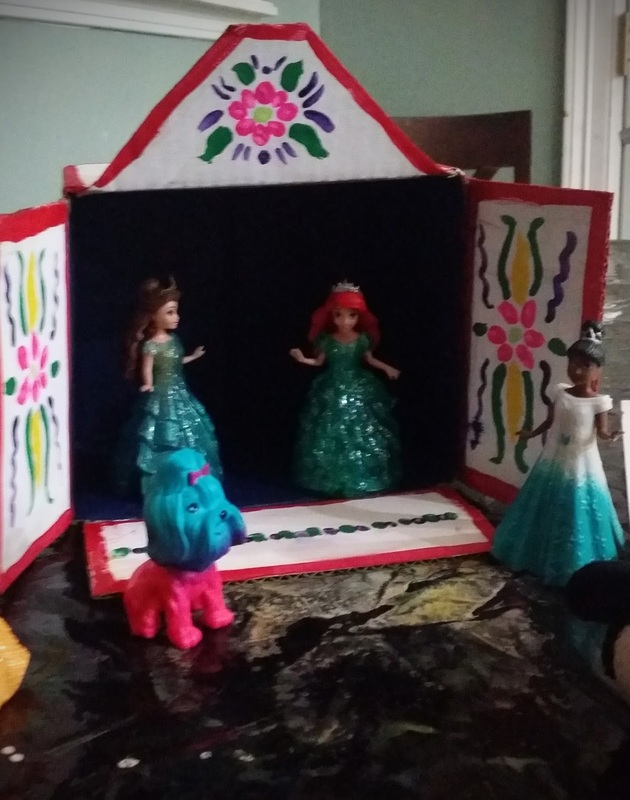 For bicultural/bilingual families like mine, it’s also time to learn about our traditions and connect our two cultures. I hope you have a rich holiday season full of love, family, culture, and books! Mariana Llanos is a Peruvian-born writer and mother of three. She has published six children’s books available in English and in Spanish on www.amazon.com or her website www.marianallanos.com . Mariana visits schools around the world through virtual technology to encourage children to read and write. For this season, Mariana recommends The Wanting Monster (El monstruo quierelotodo in Spanish), a story about a boy who wants everything he sees around Christmas time. Mariana is currently working on The Wanting Monster 2: Andy goes to Perú. Connect with Mariana on Facebook, Twitter, Pinterest, and Amazon.